Home prices in Q4 continued ri..
MTSU study: Habitat for Humani..
Officials from the Tennessee Department of Veterans Services and Tennessee Higher Education Commission met Tuesday (March 26) with leaders from the Charlie and Hazel Daniels Veterans and Military Family Center at Middle Tennessee State University. 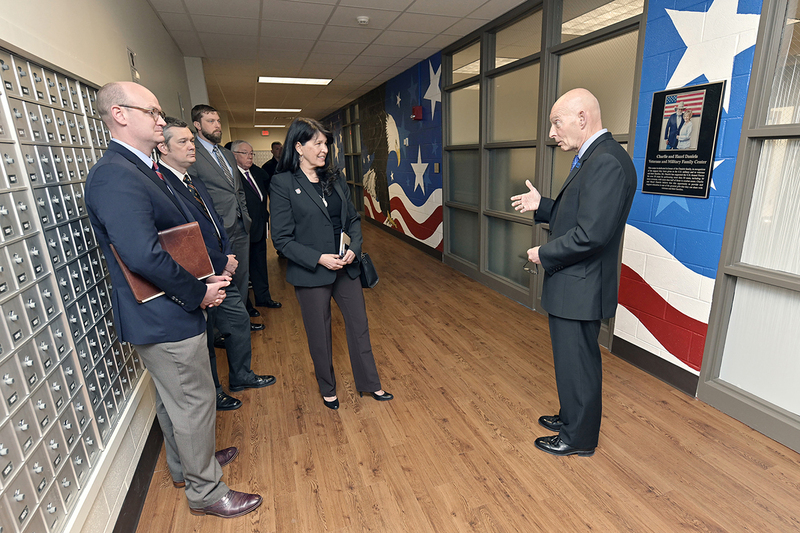 THEC Executive Director Mike Krause and part of his staff joined new Tennessee Department of Veterans Services Commissioner Courtney Rogers and two staff members on her first visit as commissioner to the center located inside Keathley University Center. They met with Keith M. Huber, senior adviser for veterans and leadership initiatives and a retired U.S. Army lieutenant general, and MTSU veterans center Director Hilary Miller for a tour, to learn about the university’s initiatives and how the center supports vets and their family members. “The purpose of today’s meeting was to have the privilege to meet Tennessee’s new commissioner and her team and to share with them how we assist veterans and military family members in transition, and to see how we can work closer together in service of our veterans,” Huber said. “I thought it was a tremendous interaction and exchange of information,” Huber said about the meeting. 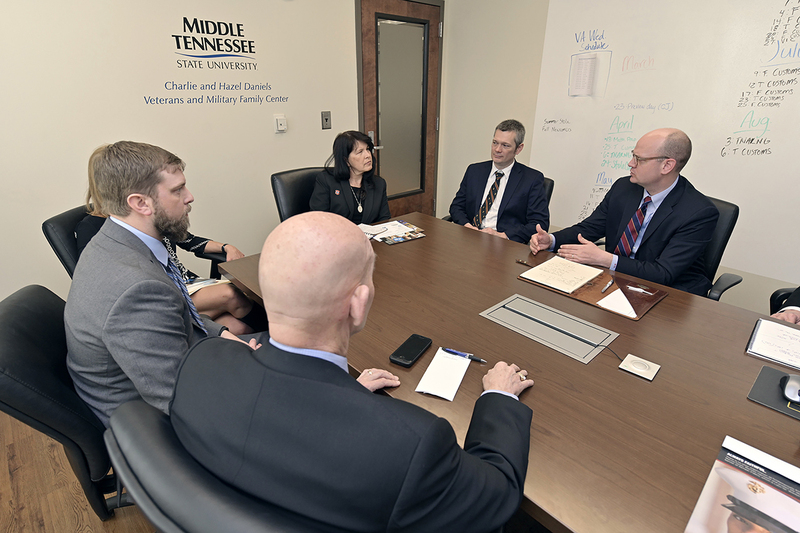 Part of the exchange of ideas and information-sharing included details of how MTSU is assisting veterans not only through the academic, benefits and VA challenges, but in finding full- and part-time work with a list of employers growing to nearly 100. Deputy Commissioner Tilman Goins and Chief of Staff James Amundsen joined Rogers for the visit. Krause is veteran and frequent participant in veterans-related activities such as the Huber-led Veterans in Motion Conference in January at the Rutherford County Chamber of Commerce. Joining Krause at the MTSU meeting were Tom Morrison, THEC assistant executive director of veterans education, and Mitch Curry, THEC veterans affairs specialist. Krause said he will lead a group of Tennessee college and university presidents on a visit April 5 to Fort Campbell. Rogers, appointed commissioner by new Gov. Bill Lee, replaced Many-Bears Grinder, who often appeared at MTSU’s veterans-related events, including the Stole Ceremonies for graduating seniors. Huber and Miller invited Rogers to the April 24 Stole Ceremony. A native of Hawaii, Rogers is a retired U.S. Air Force lieutenant colonel with a combined 28 years of military service in the Air Force and Tennessee Air National Guard. The Sumner County resident served three terms in the Tennessee General Assembly as a state representative. The Tennessee Department of Veterans Services serves more than 474,000 veterans and family members. The Daniels Veterans Center serves about 1,000 student veterans and family members. Including Keathley University Center first- and third-floor office space, the veterans center features 3,200 square feet devoted to veterans. For more information on the center, call 615-904-8347 or visit https://www.mtsu.edu/military/.